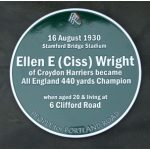 A local sporting heroine, Ellen Wright became the All England 440 yards sprinting champion in August 1930. Little is known about her, but she lived with her family in South Norwood at 6 Clifford Rd. Her father, Tom Wright, had one of his cobblers’ shops there. She later emigrated to Australia. The unveiling ceremony was attended in strength by the local athletics community, represented by Croydon Harriers, whose base is at the Arena. 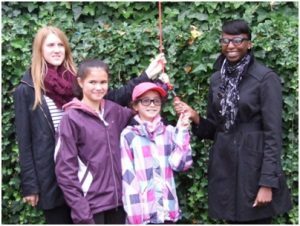 Olympic runner Donna Fraser, who lives locally, is joined by young Croydon athletes for the unveiling ceremony.